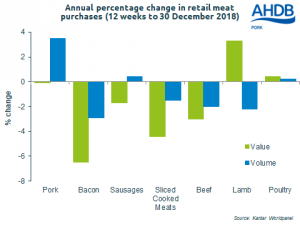 During the 12 weeks ending December 30, total primary meat retail sales remained steady on year earlier levels, according to the latest data from Kantar Worldpanel. Within this some categories did perform more strongly than others. Of course the most recent period includes the all-important Christmas period. Retail sales volumes of fresh and frozen primary pork recorded a 4% increase year-on-year, although declining shelf prices meant that the value remained stable. The growth was driven by chops/steaks and shoulder roasting joints, which performed strongly, although leg roasting joints declined in volume. Rebecca Oborne, an analyst at AHDB, said: “The picture was less positive for other pig meat products. Bacon sales declined 3% in volume compared to year earlier levels, and a 4% drop in average prices meant the value of the market was down a noticeable 7%. Sausages remained stable in volume terms, while ham recorded a modest decline, and both these categories also recorded falling prices. Ms Oborne added: “Similarly, for the 52 weeks ending December 30, total pig meat protein sales were very similar to year earlier levels. Reflecting their popularity over the summer, sausages recorded an increase of just over 1% in volume. However, this was countered by a 1% decline in volume for primary fresh and frozen pork. Value remained somewhat flat compared to 2017, with an increase in sausage prices counteracted by lower prices for bacon, beef and lamb sales.